Original dated to approximately 1400. Commentary by Bjarne: This dress has been reconstructed by some Danes. Originally this dress was made for Margrethe I of Denmark who united Scandinavia. 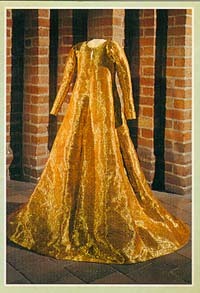 The fabric was remade also, of real gold metal and silk. It was on exhibit at the Danish National Museum when they had a show of Margrethe I. 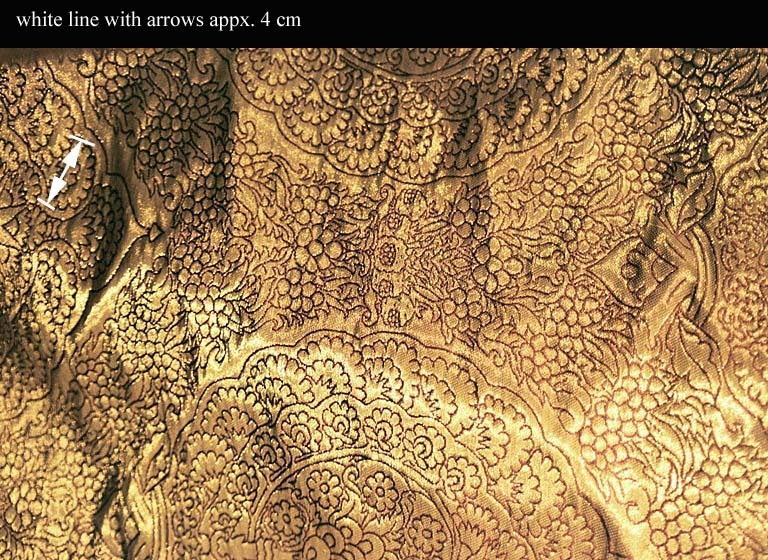 The gold cloth was fabulously made with a intricate wowen pattern. The reconstructed dress has long sleeves, I believe they found out that the original had long sleeves. their points, surrounding a central motif of something that resembles a pineapple. It is generally considered to be of Italian manufacture. The gown will have used around 10 3/4 metres of fabric at the known loom width of 60cm. Front and back of fabric. 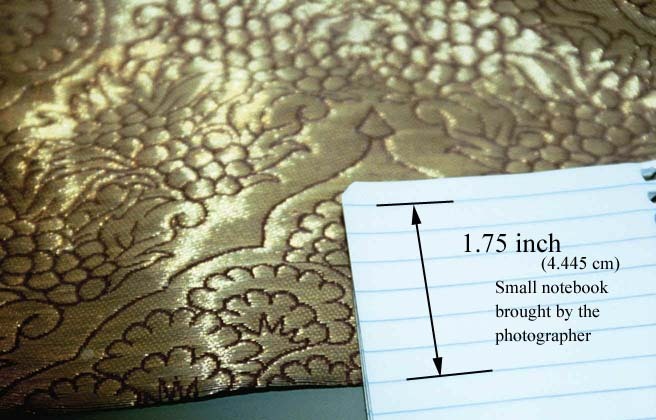 Larger view of the fabric with white line scale attempt by cv. This makes each round medallion -- see half of one at the bottom of the picture, about 32cm in diameter or just over a foot across. what way we were unable to establish. 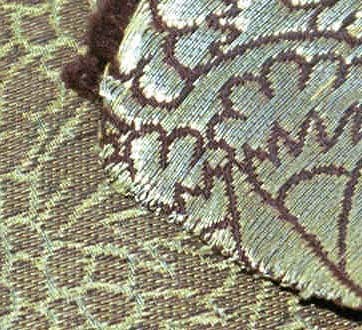 of all was the pattern of the fabric: was it really 14th century? 'This second edition of the book incorporates a number of revisions. have been made to "Scandinavian Costume". Can Have Worn the Golden Gown?" 'The narrow loom width, about 60 cm, is no evidence for a late dating. 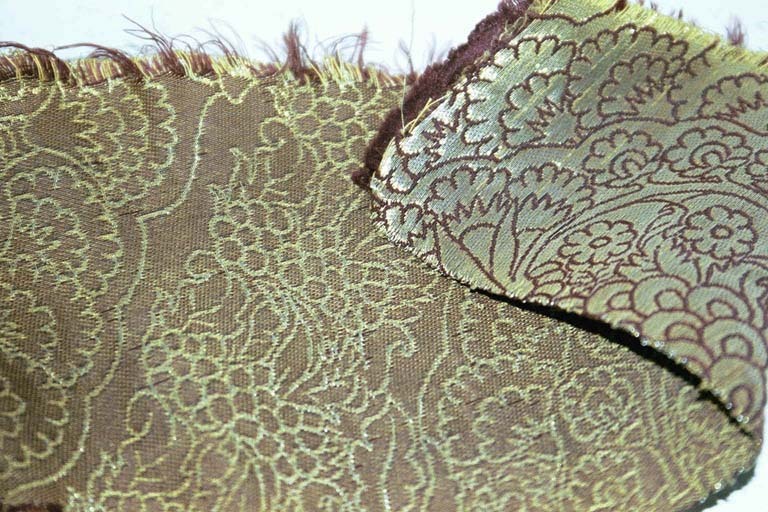 fabric, and also, for comparison, from the fragmentary linen lining. of the 15th century (1403-1439). by order of King Charles X, deposited in Uppsala Cathedral. revision and also that an accurate restoration of the gown was required. whole of the centre motif and at the top forming a kind of "accolade". which frequently reappeared in Italian silk weaving of the Quattrocento. 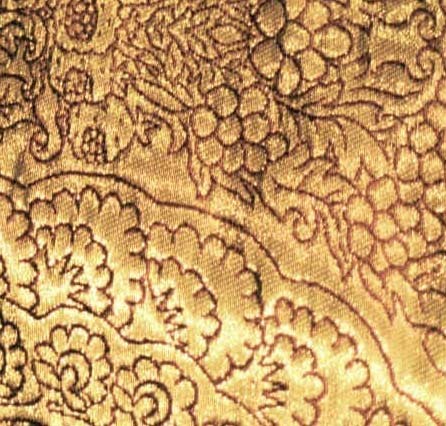 The pattern-forming layer of the weave is shot through with gold. and unevenness of the gilt layer, the silver sometimes shows through. remained a standard commodity for well over a hundred years. north German painters of the 15th century. more emphasised the leading position of Lucca.